Whether it’s loose-leaf green tea, strong black coffee, or sparkling water, we take our beverages very seriously! We use all of these products in our own kitchen. They’re my favorites, and I bet they’ll be yours, too. Good beverages start with good water. Got tea bags everywhere? Get organized! Set the temperature for perfect coffee and tea every time. We use this daily. Most glass carafes are way too small--but this hefty jug holds two liters, and is perfect for brewing sun tea. Get perfectly-ground coffee for the most consistent flavor. 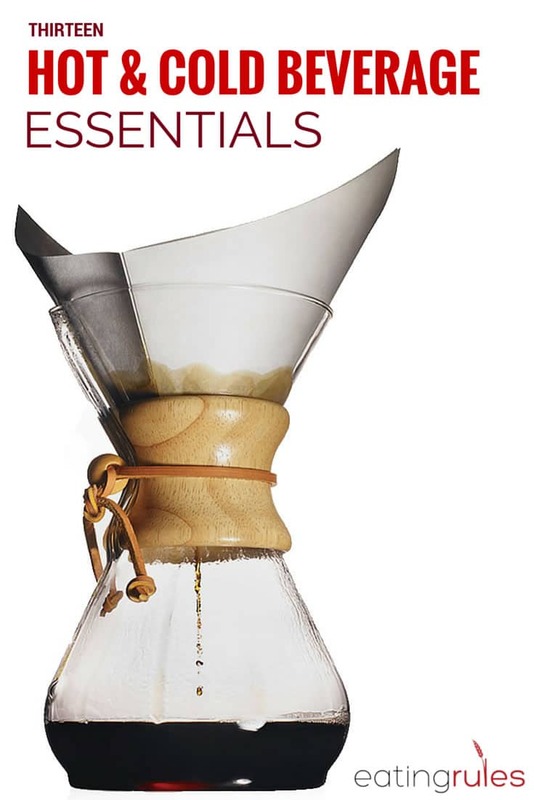 Once you get the hang of brewing coffee in a Chemex, you'll never want to go back. Don't forget to compost the filter and the spent coffee grounds! You may want to get two, so your spices don't taste like coffee! Forget fumbling with those "tea balls" - use this instead for brewing loose-leaf teas. I LOVE my HydroFlask! Fits perfectly in a car cup holder, insulates very effectively, and has a lifetime warranty. Keep grubby hands out of the ice bin! Yes, they really are as good as everyone says.